Colin Thom is a Senior Historian with the prestigious Survey of London – the nearest thing we have to an ‘official’ history of London’s architecture. After 14 years with English Heritage, the Survey last week became part of the Bartlett School of Architecture at University College London. The Survey’s work, providing a definitive history of different areas of London and their buildings, will continue there. Its new double-volume study of Battersea, published today by Yale University Press, was researched and written for English Heritage. Everyone knows Battersea for its power station and its dogs’ home, both of which are covered fully in our new books. But the area has many more remarkable stories to tell and interesting buildings to offer. Hard though it is to believe now for a district long synonymous with smoking factory chimneys, gasworks and railway yards, but Battersea was as late as 1850 still an agricultural parish, renowned for its market gardens. The low-lying riverside soil produced high-quality vegetables for the London markets, and Battersea was particularly famed for its asparagus. 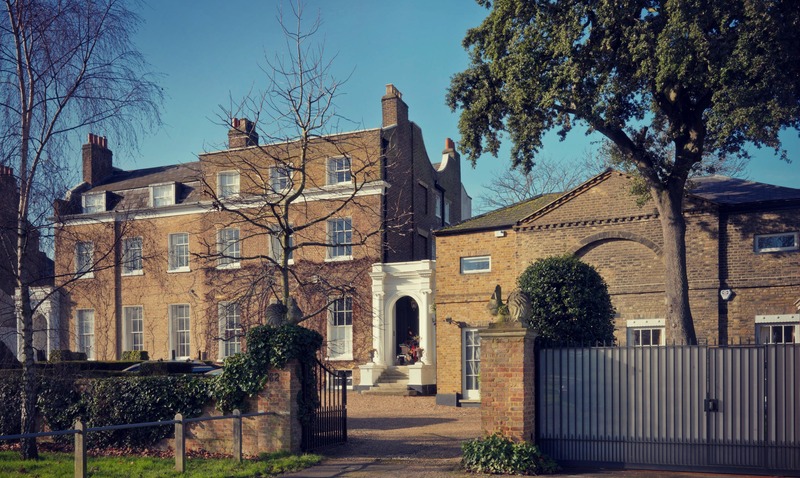 Also, the higher, better-drained ground around Lavender Hill and beside Clapham and Wandsworth Commons became a popular spot for London’s late-Georgian merchants to build their elegant ‘villas’. These included the wealthy banker and evangelical Henry Thornton and his friend William Wilberforce, both of whom lived in fine houses on the Battersea side of Clapham Common at the time of their famous campaign to abolish slavery in Britain. 81 & 82 Clapham Common West Side in 2013. Designed by James Burton in the 1790s, these houses on the west side of Clapham Common are typical of the elegant villas erected there in the later Georgian period. But urbanization and growth then hit Battersea at a frenzied pace. It took only 40 years for those fruitful green fields to disappear beneath factories, churches, schools and streets of workers’ terraced housing, all criss-crossed by a tangle of railway lines. Population leapt from 10,000 in 1851 to around 150,000 by 1891— equivalent in size to a major provincial town. Battersea’s factories were notoriously noxious and malodorous, chemical manufacture being particularly common. It was said at the time that workers could be identified simply by the discolouration of their skin: white for the flour millers; black for those handling graphite in the crucible works; yellow for those making explosive shells in the Nine Elms projectile works. But the industrialized riverfront and the ethereal effects of smoke, fog and water also provided artists like Whistler and Walter Greaves with inspiration for some of the era’s best urban landscapes. Battersea is the subject of several of Whistler’s impressionistic Nocturnes. 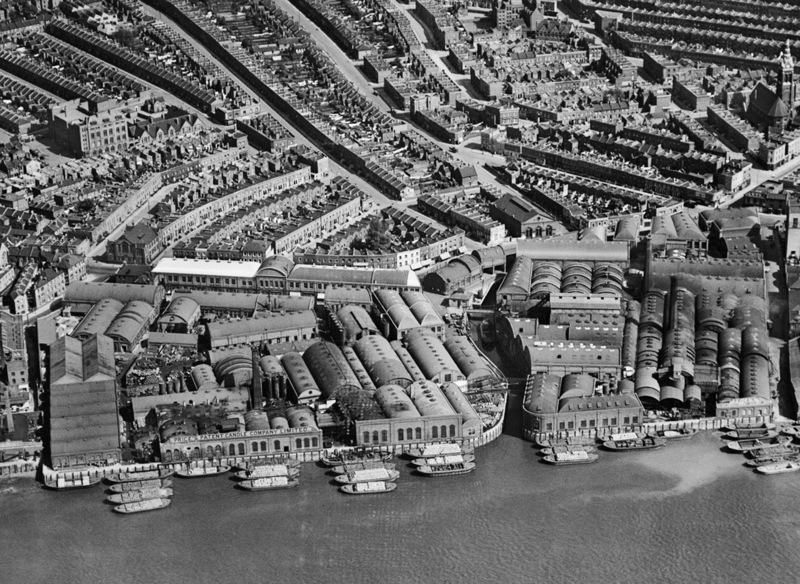 Price’s candle factory and other riverside factories from the air, 1928. Price’s candle factory, which opened off York Road in the mid 1840s, was one of the biggest and best-known in the area. Note also the packed streets of terraced workers’ housing behind. But now all that industry has gone, with only the empty hulk of Battersea Power Station as a reminder of this important aspect of the area’s past. After decades of disuse the power station seems to be, at last, on the verge of a rebirth; let’s hope so. It is one of London’s finest historic buildings, with a dramatic setting on the Thames. Sir Giles Gilbert Scott’s exterior design gave rare style and panache to a functional structure, and its long-disused control room, designed by other architects and engineers, is still one of London’s best 1920s interiors. Battersea Power Station, Station ‘A’ Control Room (of 1929–35) in 2011. One of London’s most elaborate Art Deco interiors, with marble wall linings and a ‘Jazz Age’-style steel-and-glass ceiling, the control room was the work of the architect J. T. Halliday, who with the engineers S. L. Pearce and Allot & Son. But it wasn’t all grim workers’ housing, railways and industry. Battersea includes three large and much-loved public open spaces. Despite their names, about half of both Clapham and Wandsworth Commons are in south Battersea, and to the north is the green oasis of Battersea Park, created in the 1840s and 50s and renowned for its sports and recreations, exotic planting, Festival Pleasure Gardens and sculpture exhibitions. And from late-Victorian times a progressive council did much to improve local services, providing many new and attractive public buildings, including the town hall and library, both still on Lavender Hill. With them came a renewed sense of civic pride. After the Second World War, despite a spate of council-house building, Battersea spent many years in the doldrums. But recent decades have seen wealth flood back into the area with a new generation of young professional residents, especially in the south. 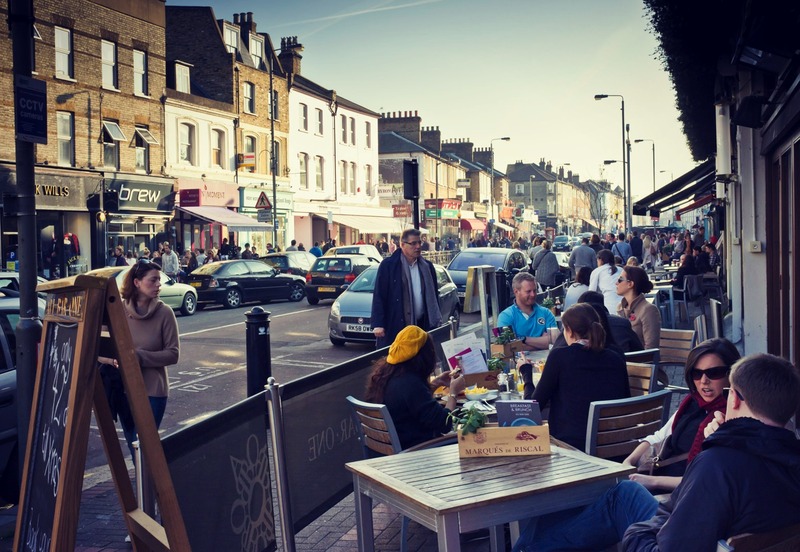 This tendency is most evident in the grids of streets between the two commons, in and around Northcote Road, with its upmarket boutiques, restaurants and bars. Northcote Road street life, 2011. Nowhere better expresses Battersea’s resurgence since the 1970s than the chic boutiques, café chains and restaurants of Northcote Road and their mostly well-heeled and youthful clientele. This canter through the area’s history and building fabric has omitted much: for example, the many fine Victorian churches, schools and colleges, theatres and cinemas, to name but a few – even a Heliport. Battersea may no longer be industrial, but it is manifestly still thriving, with many unusual and significant buildings to offer the architectural enthusiast. Detailed accounts of all aspects of Battersea’s history are packed into these two new, beautifully produced and heavily illustrated volumes. Very interesting post. Like most visitors to London I’ve only seen Battersea from across the Thames, but now I feel like I’ve had a glimpse into the history of the area. Its fascinating to look back at areas we know only from their Victorian or 20th century overcrowding and see what they must have been like before urbanisation changed the region. Thanks very much David, glad you found it of interest. Every time we investigate an area of the capital in detail we unearth new or little-known facts and stories, and Battersea certainly has lots more to offer people who are interested in London’s history and architecture than they might at first think. I want to say thank you very much for the Battersea Survey. I have lived, worked and been active in community life here for 55 years since I arrived as a young immigrant from Ireland. I am proud of its heritage as a progressive, socialist borough till gentrification in the seventies! As a member of the Battersea Society I have been writing to a local councillor, who has responsibility for conservation and heritage, about the need for Battersea industrial information boards along the river from Wandsworth bridge to Vauxhall bridge.